Hover over the pie and doughnut charts. Make sure thevalues tooltip displays the year, then data category & value in different line. The year should match the legend. Go over the rest of chart types. Ensure their values tooltips are consistent (multiline, first the legend then the category and value...). 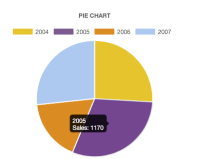 Visit http://YOURMOODLE.moodle.com/integration_master/lib/tests/other/chartjstestpage.php Hover over the pie and doughnut charts. Make sure thevalues tooltip displays the year, then data category & value in different line. The year should match the legend. Go over the rest of chart types. Ensure their values tooltips are consistent (multiline, first the legend then the category and value...). While working on MDLSITE-4399 I noticed a small bug in our charts API. I was trying to debug this shortly but did not find anything obvious that could cause this. When the chart type is changed to, say, bars, the labels are displayed correctly.